drives are grouped into layers by size. What this means is that if you add 4TB drives in as replacements for 2TB drives, you create a 4TB disk layer and a 2TB disk layer that are, transparently to you, contributing to a single virtual volume. The minimum require disk count per spindle size is 2 in order to retain protection. Disks are replaced one at a time. So in the case of 6 2TB drives, 1 is replaced by a 4. Once sync’d, a second has to be replaced before the array is protected again. Once 2 4TB drives are part of the volume, protection will be in sync again. At this point the space sacrificed to volume protection will jump from a single 2TB spindle to one of the 4TB spindles (space inefficient, but at least it allows mixing). In dual disk redundancy modes, the spindle counts are doubled. With all of the above in mind, I decided to move forward with the 2TB to 4TB scenario, replacing 2 of my Seagate disks with the new Hitachi HST efficiency series 5400 RPM 4TB disks. 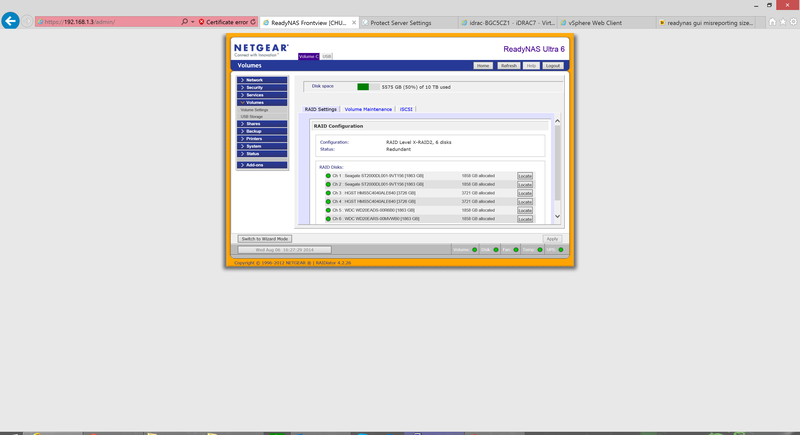 Following the process as prescribed by Netgear went well. I pulled one of the 2TB disks, swapped the 4TB into the carrier (this took longer than the required 10 seconds you need to wait before swapping back in) and then installed the 4TB disk into the array. The Netgear immediately flipped to “unprotected” and “disk fault” upon removal of the 2TB disk and switched over to “resyncing array” about 5 minutes following installation of the 4TB disk. The first resync took 26 hours. This is on a 9.25TB usable array which was about 33% full. After resync, I did a reboot just for good measure. Ah ha! 11,645,691,704 1K blocks so, in other words, 11.6TB! Much better. The good news is that as I copy about 5TB up to the array, df is, as expected, reporting spot on accurate usage whereas the GUI is staying very fuzzy and very wrong. The conclusion? Something is up with the GUI post expansion (and post reboot as I rebooted twice to attempt to remediate). This is where things stand so far. As the situation develops or changes, I will update!